Enter the Wheel of Fortune Secret Santa Sweepstakes 2016 and you could win big! 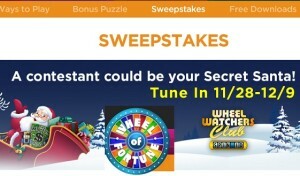 Win what the contestants win with the Amazing Secret Santa sweepstakes from Wheel of fortune! Join the Wheel Watchers club and get a Spin I.D to enter, its completely free! You can enjoy watching this addictive tv show and enjoy it even more knowing you could win some amazing prizes, just like the lucky contestants! One of the contestants could be your secret santa! Tune in and watch for your spin I.D. 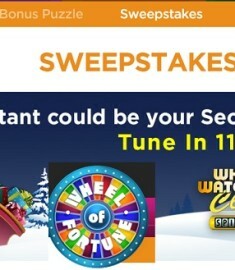 The Wheel of Fortune sweepstakes ends December 9th, so make sure you get started for your chance to win big! Dream vacations, a Sears shopping spree, a new car, and lots and lots of cash could be yours! I love a great TV sweepstakes and this is definitely one of them!